I’m an engineer. Most of the time these days I focus on software engineering so I always look forward to engineering challenges that involve hardware. My left headlight bulb went a few days ago. I know, changing a bulb should be straight forward, that’s what I thought as well, but since my right headlight bulb went in November I know different. Obviously Citroen designers though long and hard how to attract more customers to the authorised dealership network. My first attempt to change the headlight bulb back in November was right when it happened, late evening, dark, it’s raining, bought a spare at a patrol station. Good 45 minutes of struggling got me as far as taking the old one out and I was properly fed up trying, 1.5 hours next day did not help either so in an attempt to save further frustration I stopped in a local garage hinting at my initial difficulties. Fortunately they took up the challenge and two hours later I had my bulb changed. With the experience last time around I decided this time to get the Halfords guys to fit the new bulb for me. I was slightly suspicious though when it was kindly explained to me, I will only be charged for the service once the bulb is fitted. Guess what? I didn’t pay. Falling far short of 2 hours the guy gave up when he couldn’t even unplug the wires. Today, with renewed energy and determination not to let Citroen lure me into their trap, equipped with a camera to explore the headlight design, I took up the challenge and succeeded. 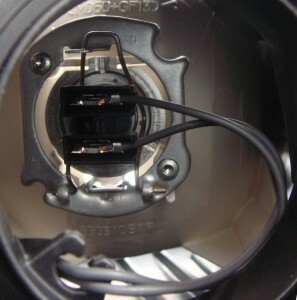 In case you also wonder how to change headlight bulb in Citroen C4 here are some hopefully helpful pictures and quick instructions. Here is the bulb with the wires attached. Taking them off took some time, the key is to hold the bulb mount with one finger while delicately pulling the wires out. 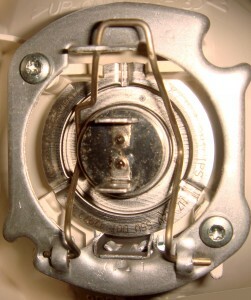 On the right, with the wires off. Make sure you don’t drop the spring or the bulb. 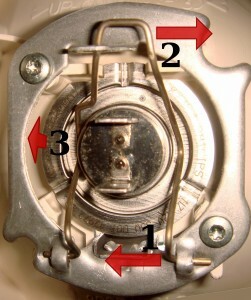 I found inserting the new bulb is easier when you look at the front through the headlight glass (from outside) and then just following the directions in reverse order: attach the left arm of the spring in the lower bottom hinge, lock the spring at the top in the latch and finally secure the right arm of the spring in the lower right hinge. It took less then 20 minutes in total and so I was well impressed with myself. enough to say there is no mention of any of the above in the manual. Thanks for the info. Very simple but so informative. Was driving me mad, but that tip with the bottom of the spring clip did it for me. 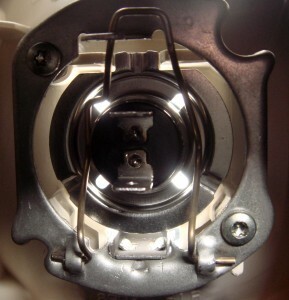 Just be careful refitting the new bulb, as they can be out of line, when placed in the housing if you are not careful. Thank you! I also have by now wasted a bit over an hour unsuccessfully. Interstingly, I tried to look on youtube, there’s nothing. Glad I finally simply googled. But how do you get to see what is in your pictures on a real C4? What has to be removed from the front of the car to get a good run at the works?